When BMW Motorrad extended the GS family with an entry-level and medium category in 2007 in the form of the F 650 GS and the F 800 GS, there was no doubt as to the message: lots of riding fun based on light, safe controllability over all surfaces, plenty of drive power and endurance on trips - even when there are only gravel tracks left to get you where you're going. A concept in two versions which many motorcycling fans responded to enthusiastically. F 800 GS. As always, BMW Motorrad has faced the challenge of taking something that is already good and making it even better, consistently focusing on building on the characteristic strengths of the GS in refining the concept. 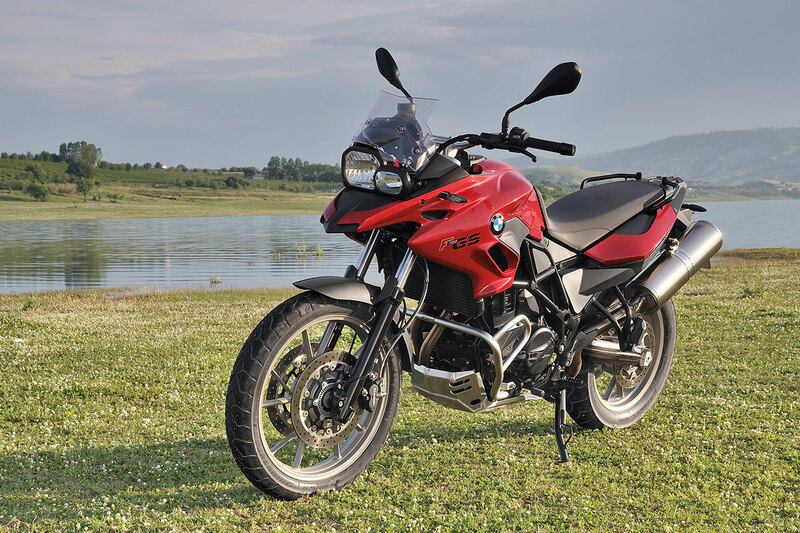 The new F 800 GS combines suitability for road use and touring with superior off-road qualities, bringing the two worlds together to an extent not previously seen in this class of motorcycle. By contrast, the new F 700 GS is geared more towards motorcyclists who do not yet need quite the same level of off-road expertise. Its strengths are a lower seating height, all-round capabilities for everyday use and more than sufficient power while also offering outstanding economy. 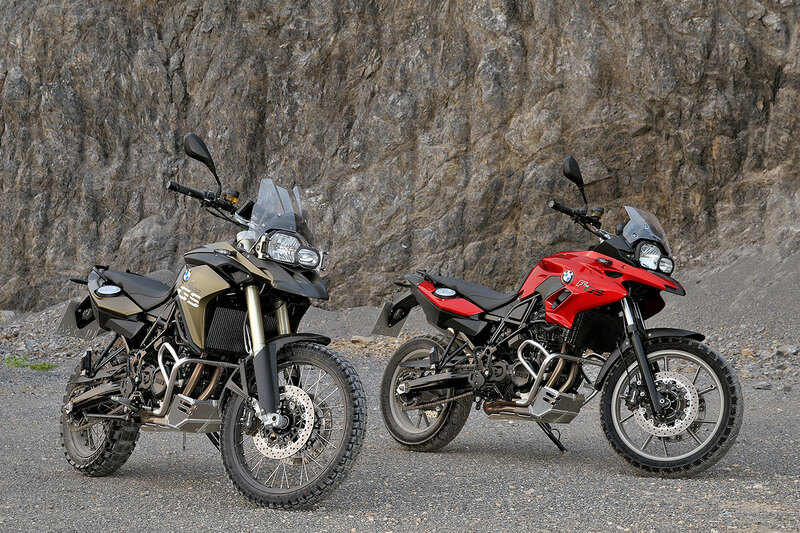 BMW Motorrad ABS as standard in the new F 700 GS and F 800 GS. The new F 700 GS and F 800 GS also feature other safety-related innovations within their respective classes such as the optional ASC (Automatic Stability Control) and the likewise optional ESA (Electronic Suspension Adjustment). The well-proven parallel twin - now with increased output and torque for the new F 700 GS. Both the F 700 GS and the F 800 GS continue to draw their power from the distinctive, liquid-cooled 4-valve 2-cylinder engine with 798 cc, electronic fuel injection, closed-loop catalytic converter and 6-speed gearbox. Its spontaneous response, impressive pulling power and low fuel consumption are what give it a particular fascination. Another unique feature in serial production motorcycle manufacture is the mass balance based on an additional connecting rod. This compensates for first and second-order inertia forces, ensuring that the 2-cylinder runs with a low level of vibration. In the F 800 GS, the power unit still delivers 63 kW (85 hp) at 7,500 rpm, producing a maximum torque of 83 Nm at 5,750 rpm. 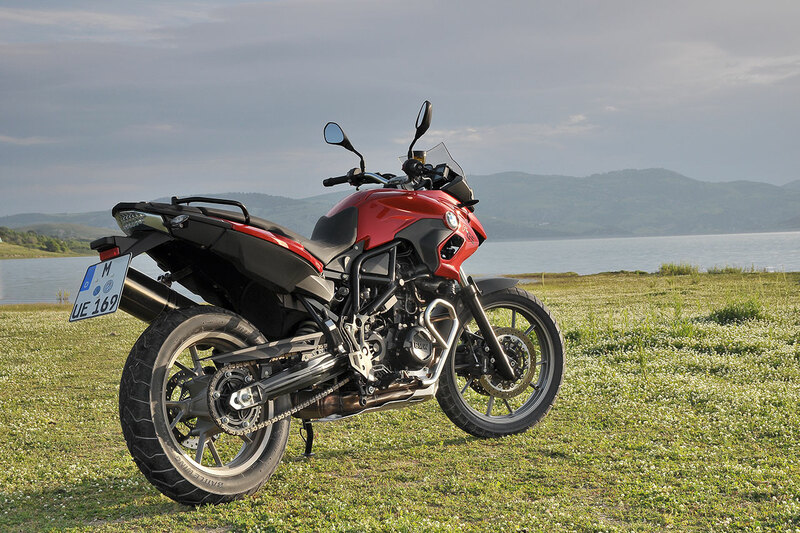 As compared to its predecessor, the new F 700 GS benefits from a boost in terms of output and torque. With 55 kW (75 hp) at 7,300 rpm (F 650 GS: 52 kW [71 hp] at 7,000 rpm), its engine now delivers 4 hp more power and with 77 Nm at 5,500 pm (F 650 GS: 75 Nm at 4,500 rpm) it also sees an increase in maximum torque. In conjunction with a somewhat shorter overall gear ratio, the bike now offers even further enhanced engine performance and riding dynamics. F 700 GS now fitted with double disc brake. ABS now standard in both models based on the "Safety 360°" principle. The new F 700 GS and F 800 GS draw on established suspension technology. The steel frame in tubular construction integrates the engine as a load-bearing element. The rear frame in square steel tubing, the aluminium double-sided swing arm and the wheels and tyres all remain unchanged. Like the F 800 GS, the new F 700 GS is now fitted with a double disc brake on the front wheel. What is more, the two new GS models are fitted as standard with a new generation of the BMW Motorrad two-channel ABS for the first time. The Electronic Suspension Adjustment ESA is a new feature in this motorcycle segment. Available as an option ex works, it allows the rider to conveniently set the rebound stage damping of the rear spring strut at the press of a button on the handlebars, with the settings "Comfort", "Normal" or "Sport" available, thereby adapting the set-up to the needs of both route and riding style. The handwheel for setting the desired spring mount has been optimised for improved controllability. F 700 GS and F 800 GS. This BMW Motorrad traction control system prevents unwanted spinning of the rear wheel while accelerating, which would result in the loss of lateral grip and thus break-out of the rear wheel. The welcome consequence - especially when the road surface offers reduced friction - is an increase in riding safety. BMW Motorrad switch units. These are more compact in design and offer improved ergonomics. Cockpit with new dial faces and an extended range of information. The analog speedometer and engine speed display are arranged vertically, their new dial faces ensuring further improved legibility of road speed and engine speed in the new F 700 GS and F 800 GS. What is more, the information display already includes fuel level and coolant temperature as standard. Smoke grey turn indicator glasses and smoke grey glass covering on the LED rear light. New body features, distinctive model-specific design and new paint finishes. F 700 GS and F 800 GS even more authentically. The package of visual measures is rounded off with new paint finish concepts and inscriptions. Lowered suspension now also available for the new F 800 GS. In response to popular demand among existing F 800 GS customers for a reduction in seating height, BMW Motorrad now offers a lowered suspension in conjunction with a lower seat as an ex works option and as a special accessory. Extensive expansion of the range of options and special accessories. As part of its model revision measures, BMW Motorrad has also significantly broadened the range of options and special accessories, thereby addressing the widely differing areas of use pursued by BMW GS customers. The latest generation of BMW Motorrad two-channel ABS as standard.Double disc brake system at front - now also for F 700 GS. Automatic Stability Control ASC (ex works option). Electronic Suspension Adjustment ESA (ex works option). Rear spring mount can be adjusted via optimised handwheel. Newly designed body features in a more dynamic, masculine look. Red apple metallic, Ostra grey metallic matt and Glacier silver metallic. Kalamata metallic matt, Cordoba blue and Alpine white 3. New handlebar switch units and brake fluid containers, front. New handlebar clamp for F 700 GS. Cockpit with new dial faces for speedometer and engine speed display and an extended range of information. New windshield for F 700 GS. Smoke grey turn indicators and smoke grey LED rear light glass covering. Lowered suspension for F 800 GS (ex works option/special accessory). Power reduction to 35 kW (48 hp) (ex works option). Engine map adjustment for regular fuel (RON 91) (ex works option). Comfort seat now available as an ex works option too. Case carrier for Vario case now also available as an ex works option. New centre stand as ex works option. Comfort package: on-board computer, heated grips, case holder, centre stand (ex works option). Safety package for F 800 GS: ASC and ESA (ex works option). Safety package for F 700 GS: ASC, ESA, RDC (ex works option). LED auxiliary headlight for F 800 GS (special accessory). Enduro footrests, wide (special accessory).